Review: About a film director who retreats into his memories and fantasies. An interesting film. One that involves a lot of concentration in order to fully understand. I found it hard to distinguish the past and present. At the Academy Awards in 1964 this won 2 Oscars and they were for Best Costume Design, Black-and-White and also Best Foreign Language Film (Italy). One American film critic wrote about this film “Almost no one knew for sure what they had seen after one viewing”. 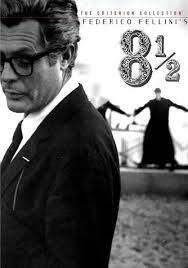 A very stylish and thought provoking film from one of cinema’s finest directors.